Last week, there was not one, not two –but three major MBA rankings released. Forbes also published a separate ranking of “The Best International Business Schools” – with slides of “The Best International 2-year MBA Programs” and slides of “The Best International 1-year MBA Programs. Just three days later, The Economist published its annual ranking of full-time MBA programs (a combination of U.S. and international MBA programs). As I said, when it rains, it pours. For MBA programs that have moved up in the rankings, or have been ranked for the very first time, it’s like the sun has come out. For others, whether it’s a drop in position or they have yet to be represented, it may seem — well, a bit cloudier. While we know that media rankings do not tell the entire story of a business school’s strengths and value proposition, the fact of the matter is that many prospective MBA students all over the world make decisions, in part, on these rankings. I remember when a prospective full-time MBA student came into my office for an interview clutching the Financial Times ranking and asking me point-blank why a close competitor was higher up in the survey. The challenge is that no matter where your MBA program lands in media rankings, there will always be other business schools with more desirable positions. Even if your MBA program is ranked in first place, there are so many different media rankings and such volatility that there’s bound to be at least one other business school, at one time or another, in a “stronger” position. But is that necessarily a bad thing? 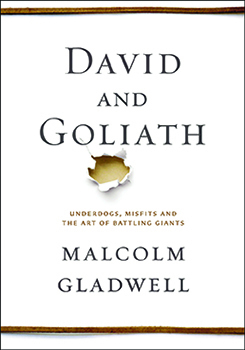 As an observer of MBA rankings from a marketing communications perspective, it was ironic that the day that Forbes rankings came out was the same day that I began reading Malcolm Gladwell’s new book, David & Goliath: Underdogs, Misfits, and The Art of Battling Giants. In his latest book, The New Yorker columnist and author of such bestsellers as The Tipping Point and Outliers demonstrates the advantages of disadvantages. Through the example of David and Goliath, he explores the relationship between “underdogs” and “giants”. It’s a fascinating read overall, but I was particularly interested in chapter three since it is focused on higher education. Here, Gladwell maps an inspiring story about the Impressionists against the competitive college selection process. Gladwell argues through a couple of undergraduate case studies that the most important factor in the college selection process is what is in the student’s best interest. Otherwise, he claims, students can get sidetracked from their original career goals because they compare themselves to their peers in the classroom and get discouraged when they feel they don’t measure up. He states that as humans we compare ourselves not globally, but to people in the same situation. In other words, it’s all about fit. Regardless of where your MBA program is ranked, be sure to create opportunities that enable prospective students to explore if your program is a good match for their academic and professional backgrounds as well as needs and goals. One of the best ways to determine fit is to get more prospective students to visit your campus and experience the program for themselves. Use experiences such as class visits to help them determine if it is a good match and to overcome perceptions. And if prospective students can’t make it to campus? Find innovative solutions to bring the experience to them. Here’s one idea. Develop buyer personas based on career interests and send video clips of classes relevant to their goals. For example, if a full-time MBA student is interested in a career change from marketing to finance, send short video clips of finance classes. Finally, remember that perceived needs may be highly influenced when media rankings are fresh in their minds. It’s known as the Recency Bias. Keep your marketing focused on the bigger picture of how your program fulfills their needs. Whether you are pouring champagne or something stronger as the result of media rankings published last week, consider the rankings from a prospective student’s point of view. There is so much information and so many data points. It can be overwhelming. What can your business school do to be helpful so more prospective MBA students can make a decision based on their best interests? What do you think of these ideas? Comment on this post and share your experience with others!